President Vaclav Klaus: Climate Control or Freedom? | Watts Up With That? Guest post by John A. My impression is he was quite the opposite of a machine politician, and very much a formidable intellect. By trade, President Klaus is an economist of first rank, all too familiar with the limitations of mathematical modeling as well as the misplaced confidence of modelers. His experience under Communism remains undimmed even as some in the Western World forget what Marxism was really like. He proclaimed himself a classical liberal and had much to say in the questions afterwards on the failings of those who seek to subsume personal liberties in order to “save the planet”. He was both thoughtful and humorous in his replies to questions. Here is his speech. Enjoy. Looking back at geologic time, the 1998 Nobel Prize for Physics laureate Robert Laughlin says that “climate change is something that the Earth routinely does on its own without asking anyone’s permission” and that “far from being responsible for damaging the Earth’s climate, civilization might not be able to forestall any of these changes once the Earth has decided to make them” (p. 11). He adds that “the geologic record suggests that climate ought not to concern us too much when we are gazing into the energy future, not because it’s unimportant, but because it’s beyond our power to control” (p. 12). These formulations seem to me rather persuasive. Most of us gathered here are not climatologists or scientists in related disciplines of natural sciences, but economists, lawyers, sociologists and perhaps also politicians or ex-politicians who have been for years or decades involved in public policy debates. This is the reason why we follow with such an interest and with an even greater concern the prevailing intellectual and political climate, its biases and misconceptions, as well as its dangerous public policy consequences. Many of us came to the conclusion that the case for the currently promoted anthropogenic global warming hypothesis is very weak. We also know that it is always wrong to pick a simple, attractive, perhaps appealing scientific hypothesis, especially when it is not sufficiently tested and non-contentiously pushed forward, and to base ambitious, radical and far-reaching policies on it – without paying attention to all the arguments and to all the direct and indirect as well as opportunity costs associated with it. The feeling that this is exactly what we have been experiencing motivated me to write a book with the title Blue Planet in Green Shackles, which was published in May 2007 and in which I attempted to put the global warming debate into a broader perspective. A year after its publication, I was extremely pleased to get a book An Appeal to Reason, A Cool Look at Global Warming, in many respects similar to mine, written by Nigel Lawson. – the Copenhagen Conference in December 2009 revealed to everyone willing to see the existing heterogeneity of views and the apparent contradictions of interests. Let me repeat the three simple facts that most of us – I hope – are aware of. We can only wish our opponents, the global warming alarmists, accept that we do not question them. Otherwise, they would continue shooting at wrong targets, which is what they – probably intentionally – have been doing up until now. Let’s start with a long-term fact that the global mean climate does change. No one disputes that. It changes now, it was changing in the past and will – undoubtedly – be changing also in the future. In spite of that, we have to add that over the last ten thousand years (the era of Holocene), the climate has been much the same as at present and the average surface temperature did not vary significantly. If there has been any long term trend there has been an overall gentle cooling trend. Presenting the climate changes we’ve been experiencing in the last decades as a threat to the Planet and letting the global warming alarmists use this bizarre argument as a justification for their attempts to substantially change our way of life, to weaken and restrain our freedom, to control us, to dictate what it is we should and should not be doing is unacceptable. Their success in influencing millions of quite rational people all around the world is rather surprising. How is it possible that they are so successful in it? And so rapidly? For older doctrines and ideologies, it took usually much longer to get such an influential and widely shared position in society. Is this because of the specifics of our times? Is this because we are continuously “online”? Is this because religious and other metaphysical ideologies have become less attractive and less persuasive? Is this because of the need to promptly refill the existing spiritual emptiness – connected with “the end of history” theories – with a new “noble cause,” such as saving the Planet? The environmentalists succeeded in discovering a new “noble cause.” They try to limit human freedom in the name of “something” that is more important and more noble than our very down-to-earth lives. For someone who spent most of his life in the “noble” era of communism this is impossible to accept. The second undisputable fact is that – with all the well-known problems of measurement and data collection – over the last 150 years, which is a medium-term time scale in climatology, the average global temperature has shown warming-cooling rhythms superimposed on a small upward warming trend.This trend has existed since the Earth (or rather its Northern Hemisphere because data from the Southern Hemisphere are not available) emerged from the Little Ice Age approximately two centuries ago. We also know that this new trend was repeatedly interrupted, one important example being the period from the 1940s to the middle of the 1970s, another the period of the last 10 – 12 years. The warming in the last 150 years is modest and everything suggests that also the future warming and its consequences will be neither dramatic, nor catastrophic. It does not look like a threat we must respond to. The third fact is that also the amount of CO2 in the atmosphere fluctuates in time, sometimes precedes, sometimes follows the temperature increase, and that – with all the problems of not fully compatible time series – in the last two centuries we witness a mostly anthropogenically enhanced amount of CO2 in the atmosphere. Its concentration increased from 284.7 ppmv in the year 1850 to 310.7 in the year 1950, and to 387.3 in 2009. There is no need to dispute these facts. The dispute starts when we are confronted with a doctrine which claims that the rough coexistence of climate changes, of growing temperatures and of man-made increments of CO2 in the atmosphere – and what is more, only in a relatively short period of time – is a proof of a causal relationship between these phenomena. To the best of my knowledge there is no such relationship between them. It is, nevertheless, this claim that forms the basis for the doctrine of environmentalism. It is not a new doctrine. It has existed under various headings and in various forms and manifestations for centuries, always based on the idea that the starting point of our thinking should be the Earth, the Planet, or Nature, not Man or Mankind. It has always been accompanied by the plan that we have to come back to the original state of the Earth, unspoiled by us, humans. The adherents of this doctrine have always considered us, the people, a foreign element. They forget that it doesn’t make sense to speak about the world without people because there would be no one to speak. In my book, I noted that “if we take the reasoning of the environmentalists seriously, we find that theirs is an anti-human ideology” (p. 4). To reduce the interpretation of the causality of all kinds of climate changes and of global warming to one variable, CO2, or to a small proportion of one variable – human-induced CO2 – is impossible to accept. Elementary rationality and my decades-long experience with econometric modeling and statistical testing of scientific hypotheses tell me that it is impossible to make strong conclusions based on mere correlation of two (or more) time series. In addition to this, it is relevant that in this case such a simple correlation does not exist. The rise of global temperature started approximately 150 years ago but man-made CO2 emissions did not start to grow visibly before the 1940s. Temperature changes also repeatedly moved in the opposite direction than the CO2emissions trend suggests. Theory is crucial and in this case it is missing. Pure statistical analysis does not explain or confirm anything. Two Chinese scientists, Guang Wu and Shaomin Yan, published a study, in which they used the random walk model to analyze the global temperature fluctuations in the last 160 years. Their results – rather unpleasantly for the global warming alarmists – show that the random walk model perfectly fits the temperature changes. Because “the random walk model has a perfect fit for the recorded temperature … there is no need to include various man-made factors such as CO2, and non-human factors, such as Sun” to improve the quality of the model fit, they say. It is an important result. Do other models give a better fit? I have not seen any. The untenable argument that there exists a simple causal nexus, a simple functional relationship, between temperature and man-made CO2 is only one part of the whole story and only one tenet of environmentalism. The other, not less important aspect of this doctrine is the claim that there is a very strong and exclusively damaging relationship between temperature and its impact upon Nature, upon the Earth and upon the Planet. The original ambition probably used to be saving the Planet for human beings but we see now that this target has gradually become less and less important. Many environmentalists do not pay attention to the fate of the people. They want to save the Planet, not mankind. They speak about Nature, not about men. For these people, the sophisticated economic reasoning we offer is irrelevant. Only some of them look at the people. Only with them the debate about the intergenerational discrimination and solidarity and about the proper size of discount rates used in any intertemporal analysis comes into consideration, only here can the economists make use of some of their concepts. The unjustifiably low rate of discount used by the environmentalists (notably in the Stern Review) was for me the original motivation to enter the discussion. Chapter 4 of my book was devoted to the importance of proper discounting. Nigel Lawson did something very similar in his Chapter 7 with the title “Discounting the Future: Ethics, Risk and Uncertainty.” For him, “the choice of discount rate is critical in assessing which policies might make sense, and which clearly do not.” I agree with him that “with a higher discount rate, the argument for radical action over global warming now collapses completely” (p. 83). Many serious economists argue the same way and are in favor of using higher discount rates. University of Chicago Prof. Murphy says quite strongly: “we should use the market rate as the discount rate because it is the opportunity cost of climate mitigation.” This is what N. Stern and others clearly do not want to do. They think in misconceived ethical terms, but it is wrong. We do not deny that if the existing trend continues, rising temperatures will have both its winners and losers. Even if the overall impact happens to be detrimental – which is something I am not convinced of – the appropriately defined discount for the future will ensure that the loss of value in the years to come will be too small for the present generation to worry about. How is it possible that so many politicians, their huge bureaucracies, important groups in the scientific establishment, an important segment of business people and almost all journalists see it differently? The only reasonable explanation is that – without having paid sufficient attention to the arguments – they have already invested too much into global warming alarmism. Some of them are afraid that by losing this doctrine their political and professional pride would suffer. Others are earning a lot of money on it and are afraid of losing that source of income. Business people hope they will make a fortune out of it and are not ready to write it off. They all have a very tangible vested interest in it. We should say loudly: this coalition of powerful special interests is endangering us. I would like to thank Professors Carter and Kukla for their comments on an earlier draft of this lecture. Lord Nigel Lawson, a long-standing member of Margaret Thatcher’s cabinet where he played the key role of finance minister, published a book in 2008 reflecting both his lifelong knowledge, views and experience and the insides he acquired during his involvement in the work of the House of Lords Special Committee which, in 2005, put together the oft-cited report called “The Economics of Climate Change”, a report that was very critical of the prevailing dogmas of contemporary environmentalism. I respect Nigel Lawson very much. We’ve met multiple times, last time at the International Economic Forum in Qatar where we were both on the same panel. On that occasion, we once again demonstrated how similar our views are. The title of the book, “An Appeal to Reason”, is well-chosen and indicates what the book is about. Its subtitle, “A Cool Look at Global Warming,” is equally important. I am really glad that the Czech translation comes out less than a year after the original publication. My book, “Blue Planet in Green Shackles,” was launched one year before, but I say in all honesty that had it been the other way around, I would have gladly and extensively cited Nigel Lawson. Speaking about books on this topic, I’d like to mention another original Czech publication which just recently came out and which unfortunately – for reasons I cannot understand – went almost unnoticed. I’m referring to a book by Miroslav Kutílek, professor at the Czech Technical University in Prague, called “Rationally about Global Warming” (Dokořán Publishers, Prague, 2008), which, as the title itself suggests, takes similar views, but at a more technical level. After carefully studying the book, I came to the conclusion that I need to be even tougher and more merciless with my opinions than I have been until now. While for most people – including me – the bible of the current hysteria around global warming is Al Gore’s book “An Inconvenient Truth”, for Nigel Lawson it is Nicolas Stern’s infamous “Review,” which was prepared at the request of Tony Blair. Any reader will surely understand this well-written book on his or her own. There’s no need to explain it, so just a few comments. I agree with the author that the science related to global warming isn’t “definitely settled”and that the “peer-review-process” (nowadays a standard way of evaluating academic texts), so highly regarded by many climatologists, cannot guarantee the undeniable scienticity of a variety of arguments because it inevitably favors the mainstream opinion and “typically promotes the mediocre at the expense of the visionary and daring” (p. 108). I also agree with the statement that the Stern Review is “essentially a propaganda exercise in support of the UK government’s predetermined policy of seeking a world leadership role on climate change” (p. 21). Lawson’s argument that the level of annual average temperature is not the key to prosperity is also important. He uses the example of two exceptionally economically successful countries – Finland and Singapore. The average annual temperature in Helsinki is less than 5 °C, whilst in Singapore it is over 27 °C. The difference is greater than 22 °C! I find the author to be right on target when he remarks that “if the UK wishes to back its leadership claim in the global climate change debate, its target should be in terms not of greenhouse gas production, but of greenhouse gas consumption” (p. 57). With this, the author says that it’s no great achievement to outsource all industrial production to China, import the majority of things British people consume from China, and then criticize China for having excessive CO2 emissions. I would also like to emphasize Lawson’s much needed criticism of the IPCC (Intergovernmental Panel on Climate Change) for its claim that the solution for China and India would be “investment in attractive public transport facilities and non-motorized forms of transport” (p. 68). For me, non-motorized forms of transport would be a bicycle, a rickshaw, a donkey, or an elephant. Or perhaps a hang glider. That’s blatant communism and, on top of that, incredible arrogance. I remember very well from my youth the official propaganda saying that private cars didn’t belong to a communist society. I’m also very happy that Nigel Lawson – as one of the very few – criticizes the new indulgences, otherwise known as emissions permits. Most people like the fact that trading emissions permits sounds market-friendly and that it’s not just an administrative restriction or command, but they’re mistaken. Nigel Lawson correctly says this “trading” has nothing to do with the market. “It is essentially a government-controlled administrative rationing system, in which the rations can subsequently be traded” (p. 74). Communism again. Indeed it is a market for the owners of rations and for the various middlemen; for them it presents “a lucrative and – hopefully – growing business opportunity.” It’s, of course, a certain form of taxation, but because governments don’t like to raise taxes, they disguise the introduction of these new taxes by replacing them with this, seemingly market-like, method. In September of 2007, at the UN Climate Change Conference in New York, I had to decide whether to speak on a panel on “Mitigation” (the process attempting to stop further global warming by reducing CO2 emissions), considered to be the only politically correct approach by the organizers, the UN bureaucrats, or on a panel on“Adaptation”, which was considered politically less correct. Without the least bit of doubt, I chose the latter. Nigel Lawson favors a similar approach. He considers “evolutionary adaptation” and “the capacity to adapt” to be the “most fundamental characteristic of mankind” (p. 39). I also fully share his view that “perhaps the most serious flaw in the IPCC’s analysis of the likely impact of global warming is its grudging and inadequate treatment of adaptation” (p. 39). The IPCC, Al Gore and Nicolas Stern are in agreement with Thomas Malthus in their conscious or unconscious acceptance of the assumption of “static adaptation ability.” Economists have relentlessly and convincingly rejected this for two centuries. I also agree with Nigel Lawson that “doing nothing is better than doing something stupid” (p. 95). If we want to save our blue planet, it shouldn’t be from climate change, but – as the author says in the last sentence of his book – from entering “a new age of unreason” (p. 106). I spent most of my life in such an age. Václav Klaus, preface to the Czech edition of Nigel Lawson’s “Appeal to Reason” („Vraťme se k rozumu. O globálním oteplování střízlivě a bez emocí“, Dokořán Publishers, Prague, 2009); translated from Czech by Michaela Dvořáková. Point made in a private correspondence, July 27, 2010. R. M. Carter, Climate: The Counter Consensus, Stacey International, London, 2010; p. 148. Gregory Melleuish is right when he says that “climate change has become an issue only because it has been seen to have practical policy implication” (p. 9). G. Melleuish, “The Dubious Future of History,” Quadrant, May 2010;www.quadrant.org.au/magazine/issue/2010/5/the-dubious-future-of-history. It is not that simple to tell who is and who is not a climatologist or an expert on climate change and global warming. Ross McKitrick once said that “there is no such thing as an ‘expert’ on global warming, because no one can master all the relevant subjects. On the subject of climate change everyone is an amateur on many if not most of the relevant topics.” (as quoted by R. M. Carter, “The Futile Quest for Climate Control,” Quadrant, November, 2008, p. 10; online atwww.quadrant.org.au/magazine/issue/2008/451/the-futile-quest-for-climate-control). In his recently published book Climate: The Counter Consensus (2010), Prof. Carter suggests that “scientists who study climate change come from a wide range of disciplines” which he “groups into three main categories” (p. 22). He claims that “most of the scientific alarm about dangerous climate change is generated by scientists in themeteorological and computermodeling group, whereas many (though not all)geologicalscientists see no cause for alarm when modern climate change is compared with the climate history” (p. 23). This structuring seems to be useful. Einar Vikingur, “Carbon and Our Climate”, Quadrant, May 2010, p. 79;www.climatesceptics.com.au/documents/egv-climate-carbon.pdf. Robert B. Laughlin, “What the Earth Knows”, The American Scholar, Summer 2010. The original Czech version of the book: Modrá, nikoli zelená planeta. Co je ohroženo: klima nebo svoboda?,Dokořán, Prague, 2007. The English version: Blue Planet in Green Shackles. What is Endangered: Climate or Freedom? Competitive Enterprise Institute, Washington D.C., 2008. The book has until now been published in 16 countries in 16 different languages. Last year, I put together an additional collection of my texts devoted to this subject Blue Planet Endangered, Dokořán, Prague, 2009 (in Czech language). Duckworth Overlook, London, 2008. I wrote a preface to its subsequent Czech edition, released shortly after it was published in English (Vraťme se k rozumu, Dokořán, Prague, 2009), which is added to this text as an appendix. It was recently convincingly discussed by B. D. McCullough and Ross McKitrick (“The Hockey Stick Graph”, Fraser Forum, No. 2, 2010) and by John Dawson (“The Tree Ring Circus”, Quadrant, July-August 2010;www.quadrant.org.au/magazine/issue/2010/7-8/the-tree-ring-circus). John Dawson writes that “the Hockey Stick was the product of a pseudo-scientific mindset, faulty data selection, erroneous data identification, dubious statistical methodology, flawed mathematics, a perverted peer-review process, a frenzied propaganda campaign and unscrupulous defence mechanisms.” (p. 22). It is true especially for northern middle latitudes. There are not sufficient data for southern hemisphere and it is necessary to differentiate between the tropic and the polar regions. It is relevant that the environmentalists want to control not only us, they want to control also the climate. In its immodesty, arrogance and irrationality, the theory of climate control (the term coined by Ray Evans) reminds me of the ambitions of communist central planners to control the entire society. R. Evans, “The Chilling Costs of Climate Catastrophism,” Quadrant, June 2008 (online atwww.quadrant.org.au/blogs/doomed-planet/2008/09/the-chilling-costs-of-climate-catastrophism), in which he argues that “the warmists” try to introduce such “degree of control over our lives which is unprecedented, except in time of war” (p.12). The idea is further developed in his “Laputans in Retreat”, Quadrant, July-August 2010;www.quadrant.org.au/magazine/issue/2010/7-8/laputans-in-retreat). It might be useful to repeat what I said at a conference in Palm Beach, Florida, earlier this year: “There are plenty of arguments suggesting that the real threat for human society is not global warming itself. The real threat comes when politicians start manipulating the climate and all of us.” /“Global Warming Alarmism is a Grave Threat to our Liberty”, Club for Growth Economic Winter Conference, Palm Beach, Florida, March 5, 2010/. E.g. according to the World Meteorological Organization there are only 1311 weather stations providing ground data. It means there are 132 000 km2 per one ground station, mostly in cities. Thermometers have existed for several centuries, weather balloons for half a century, satellite weather measurements for 30 years and the compatibility of data is very dubious. There has not been a chance to create “ceteris paribus” conditions. This cooler era of approximately four centuries followed after the Medieval Warm Period of the first part of the last millennium. This warm period was in the pre-industrial age, which is for us and our argumentation absolutely crucial. It makes the CO2induced temperature increase of the current warm period difficult to defend. The CO2 data come from the Physics Institute of the University of Bern, from the Commonwealth Scientific and Industrial Research Organization in Australia, and from the National Oceanic and Atmospheric Administration in the USA. The most comprehensive recent argumentation rejecting it is in S. F. Singer et al. (Climate Change Reconsidered. The Report of the Nongovernmental International Panel on Climate Change, The Heartland Institute, Chicago, 2009), in I. Plimer (Heaven and Earth: Global Warming, The Missing Science, Connor Court Publishing, Australia, 2009), in R. M. Carter (Climate: The Counter Consensus, Stacey International, London, 2010), in the Czech scientist M. Kutílek (Racionálně o globálním oteplování /Rationally about Global Warming/, Dokořán, Prague, 2008; and in his recently published Facts About Global Warming: Rational or Emotional Issue?Catena Verlag GmbH, Reiskirchen, September 2010), and in many other books, articles and studies. Environmentalism is something else than ecology. But even ecology is only a derivative science (R. Nelson) and may be considered a science only in a “classificatory sense.” Sometimes it is only a “scientific poetry” filled with mathematical equations. An excellent discussion of this aspect of the debate can be found in Robert H. Nelson “Ecological Science as a Creation Story”, The Independent Review, vol. 14, no. 4, Spring 2010, pp. 513-534. To believe in it, one must be a person with an almost metaphysical faith in the existence of the original Garden of Eden (the Earth unspoiled by men), in the fall of man from the Garden, in the final days of the world coming because of men who have spoiled it through their economic activities based on their insatiable demands, and in the necessity of spiritual renewal of all of us as the only way to save the Earth. This may be a possible and even respectable creed for an individual but an impossible and unrespectable position when it comes to public policy. The environmentalists also succeeded in changing the customary scientific methodology. Whereas the null hypothesis should be that the climate changes we observe today are natural in origin, the global warming alarmists put it upside down. They force us to disprove their hypothesis that the climate changes are man-made (see Carter, 2010; Ch. 6). It is difficult to disprove the non-existent relationship. There is, again not surprisingly, a very good temperature forecast made by a naïve forecast model which is based upon the idea that the temperature next year will remain the same as that of the previous year (see Carter, pp. 128-129). The environmentalists, moreover, very often forget to mention that even their hypothetical relationship is not linear (or exponential), but logarithmic and that – and now I quote from the IPCC 2001 Report – “each incremental amount of extra carbon dioxide exerts a lesser heating effect.” It is not a statement of a global warming denier. It is a statement of the IPCC. The title of one of the bibles of environmentalism “Thinking like a Mountain” written more that six decades ago by the American author Aldo Leopold proves that quite convincingly. Similar motivation was the debate about the rights of future generations, excellently summarized recently by O. M. Hartwich, “The Rights of the Future,” Policy, Vol. 25, No. 3, 2009; www.oliver-marc-hartwich.com/publications/the-rights-of-the-future. I agree with him that “the very idea that there are some resources that we have borrowed from the future leads us into a logical dead-end” (p. 7). The question he raises: “Do we owe the future generations a specific set of resources? Or do we simply owe them our best efforts to leave them a free and prosperous society in which they can make their own choices?” (p. 8) is very appropriate. It is, of course, not only about resources, it is about intertemporal decision-making in general. I am also convinced that the best thing we can do now is to leave our successors a free and democratic society. I especially like his reminding us of Charles Dickens’s Bleak House and Mrs. Jellyby, the so called “telescopic philanthropist” who tries to help at a distance, but neglects her own children. I also like his point that by asking for a higher discount rate “it is not that we do not care about distant generations. It is that we do care about the present generation and about our children’s generation” (p. 83). K. M. Murphy, “Some Simple Economics of Climate Change,” Paper at the Mont-Pelerin Society General Meeting, Tokyo, September 2008. October 20, 2010 in Current News. It is very interesting how he equates the environmentalist movement with communism and loss of traditional (Judeo-Christian) spirituality. Clearly environmentalism is a pseudo-religion. Environmentalism, socialism, communism, atheism — all cast from the same mold. Havel or Klaus, who was interviewed! Vaclav Klaus also made a speech in the EU parliament, calling for greater democracy and for a viable opposition party – for Eastern Europe knows to its cost the penalties of having a government with no viable opposition. And what did our great EU parliamentarians do? – They booed and walked out. Yes, this is what our totalitarian Left want. Their right to rule, and don’t you dare challenge that ‘right’ !! 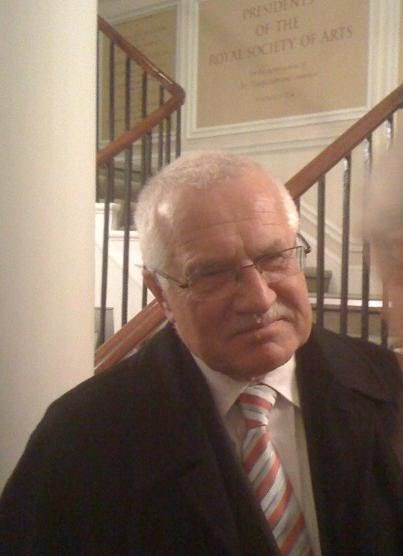 Sorry to say but Vaclav Havel (former president of Czech Republic) & Vaclav Klaus are not the same people. I’m not sorry to say, however, that I have undying respect for both. Heh,….”After carefully studying the book, I came to the conclusion that I need to be even tougher and more merciless with my opinions than I have been until now.”………We should all be, but I can’t wait to see how he’s going to about his proposition! In his book, Havel notes that “if we take the reasoning of the environmentalists seriously, we find that theirs is an anti-human ideology” (p. 4). That is the essence of most of the so-called “green” movement. The catch is to be aware that there is so much hate of people that they don’t really care what happens to animals or plants, either. CO2, for example, is plant food, and plants are the primary determinant of biodiversity. So they try to avoid generating CO2 and even to bury it in the Earth in such a way that no plants can have it. Higher temperatures are also beneficial, leading to more plants as well–and most animals are also more comfortable sans a snow coating. But we’re supposed to panic at the very idea. Some people are willing to sacrifice anything if they can kill or torture people and get away with it. But funding is also an issue. I recently searched a US Government grants website for all subjects and climate change appeared twice on the very first page. It is much easier to get grants on the basis of this nonsense than on anything approximating reality. We must contemplate more reliable ways to fund science if we want to return to the days when it was about discovering the facts and laws of nature. Good read. One thing that jumps out at me is his mention of CO2 counts relative to major industrialization around WW2. Are there any datasets or records that can be found that show CO2 concentration in that era or earlier? My understanding is the current instrument record doesn’t go back that far. As regarding so called ‘random walk’ modelling, it might be applicable in financial markets or sociological modelling where lots of individuals are making decisions, based on information available, individual circumstances and individual emotions. I would not agree this could be case with climate. Climate in long term, or weather in short, are product of many variables, that computer modelling and simulations are not able (with present knowledge and technology) to capture in all their complexity. Both are subject of physical laws we may understand in detail, but may not have integrated all occurring interactions. My own research, however remote from world of academia, shows that there is perfectly well known, researched and understood natural process, that takes apparently exactly same ‘non-random long term walk’ as two major climatic science products: CETs and the PDO index. Why it is so, science and scientists should be able to explain, if an explanation does exist. To ignore it, it is a failure on the part of those who are charged to investigate climatic matters for benefit of their governments, taxpayers and society in general. Any institution that is willing to look into more detail, ascertain value of the data and the associated background information, and if appropriate initiate a further research, is more than welcome to contact me either personally or trough WUWT. I thought that it may be interesting, as the word came up twice in President Havel’s most excellent speech, to check in the dictionary for ‘propaganda’. It is actually derived from a committee of cardinals of the RC church in charge of foreign missions. Further investigation (shorter OED) reveal that this committee was founded in 1622, and was named ‘Congregatio de propaganda fide’. The RC church in those days were not as powerful as they would have liked to have been, hence an injection of “toe the line, or else…”. Does this sound familiar? Religion seems to have waned in the public mind, so another, more powerful method of ensuring that the masses toe the line (laid down by the elite) is required, and it has to be of a scare-mongering nature, just the same as with the RC missionaries, et al who signalled doom and catastrophe from on high, and woe betide any dissenter. Fear is the element here, and the ignorance of the mass of people who have had a poor education through no fault of their own; fear also that you will upset family and friends by your questioning, by your disbelief and, perhaps through your own dogged intuition that ‘something is not right’. Such is the situation now, with propaganda being spread globally by the so-called NWO to our own children by oft-times well intentioned teachers who have already been indoctrinated by training colleges and universities. The NWO can afford to wait; they have plenty of our money. Do your own children attempt to disagree with you, regarding a common-sense approach to so-called global warming? Tell them this… Firstly, find out for yourself. It’s fairly easy to do on the interweb. Form your own opinion – never rely on others, except for your ma and pa! But even then, question, question and repeat the question if you have not received an adequate response. However, thanks again to Vaclav; it’s so reassuring to know that we have a few politicians behind us (as well as in front). It is very interesting indeed. Even more interesting given where he comes from, and that other people with pretty much the same mindset like Lubos Motl also come from the same place. It seems like some people in the Czech Republic hated the Soviet Union so much that they jumped straight into the complete opposite, i.e. blind faith in the omnipotence of free markets and the infallibility of free market democracy. I gotta tell ya, it is so refreshing to have someone of good intellectual capacity echo ones thoughts! Dave L, I’m not sure how you can bundle “atheism” with those other “isms”, unless of course the simple fact of being an “ism” is enough, so I guess fundamentalism and capitalism must be added to the list. Do have a lot of trouble with fundamental atheists in your area? President Vaclav Klaus is a great man. I read his lecture at Lubos Motl’s blog earlier this evening and I applaud the creation an official platform to oppose the political consensus of AGW/Climate Change. In Germany the first public debates about the climate science have taken off in some Colleges and Universitees and the scientists involved are grilled by the AGW establishment. The scientist who have dared to speak out are treated like outcasts as was the case with voices opposing the government of the former DDR. I am shocked that this climate of suppression is possible only 20 years after the fall of the Berlin Wall. This underlines the necessity for a political platform and I am confident this isn’t the last we hear about this initiative. I regard to the lecture, I underwrite every word spoken and I am extremely thankful for the Klaus’s courage and his intelligent and skillful approach opposing this devastating political doctrine. in the exposure of the AGW/Climate Change doctrine. Anthony Watts and many others have created some mighty powerful blogs and initiatives that effectively debunked the post natural science that is so typical for the AGW proponents. I don’t think I exaggerate when I say that thanks to the blog sphere the likes of Al Gore, James Hanson and Michael Mann are now without clothes. I also don’t think that I exaggerate when I say that thanks to the blog sphere the information that has become known as ClimateGate and the findings by Lord Monckton that the UN IPCC was working on a Global Government Treaty were send into the world in such an effective manner that derail the IPCC Copenhagen treaty. But as we speak, the barrage of devastating measures and legislation aimed at the reduction of CO2 continues. The Government of the UK for example has introduced the biggest budget reduction since the end of the Second World War that will cost the jobs of 500.000 people. But the UK will continue to spend tremendous amounts of money on wind farms and carbon sequestration projects, only to fight a non existing problem. Other countries like Spain have been brought to the brink of bankruptcy because of the costs of their Green Power policies. We have to stop this doctrine at any price. Speaking of communism, why is there such a strong connection between communism, socialism and environmentalism? The main author of the Brundtland report was later on, a vice president of SocialistInternational.org. Some of the Brundtland report’s work was done in Russia. The names of Gordon Brown, Tony Blair, Joseph Stiglitz, and Carol Browner can be found on Socialistinternational.org’s website. Mike Hulme of UEA and Obama czar (of something) John P. Holdren have said they want a redistribution of wealth from rich nations to poor nations. WTH is going on…am I losing my mind or am I seeing things here? I first heard of Vaclav Klaus three or four years ago when he was sneeringly referred to on the BBC; the topic being Global Warming. Then, I was one of the millions of brainwashed hoi poloi that never realised that there was even an opposing view to the AGW mantra (no thanks to the BBC, to whom I listen every day enroute to work) until I came across the likes of WUWT and other like blogs and gained a much belated education on the subject. Now, having read Vaclav Klaus’ address and the accompanying notes, I am totally impressed! Boy, would I ever love to sit down with a good whiskey and a yarn with him! No they ain’t. Atheism is not cast from socialism or communism. Besides which, the basis of extreme environmentalism is a virtual recasting of the Genesis “Garden of Eden” myth, which is solidly religious in nature, as Michael Crichton pointed out. Stanislaw Lem, the author of “Solaris”, had written a brilliant novel “The Use of a dragon”. If you know German, you should find it as “Vom Nutzen des Drachen”. This novel describes above CO2 – farce perfectly. Vaclav Klaus is a hero for being brave enough to stand up against the other European politicians not only on Climate Change issues but also economic issues. Whether you agree with the detail of his ideas, it does not matter — the Czech people are lucky to have a leader like him. The green&Co. are 1/2 communist only! They are for the colectivisation of the loss (Banksters, Freddy/Fanie etc..) and for the privatisation of the profits. Except that we can appreciate that some peoples representant have some knowledge about science. While communism isn’t required by atheism, atheism is required by communism(context in Leninism, Maoist type). And while environmentalism is religious in nature, in the context being used today, it is irreconcilable with the traditional Judeo-Christian spirituality. Please note! What I just stated were sweeping generalizations! I’ve tried to context the statements but I am fully aware of Christians being both communists(in the strictest sense) and environmentalists. But in both scenarios they probably wouldn’t be considered “traditional”. Good to see that the CAGW scam is being exposed by respected world figures. Here’s hoping other prominent non-believers will see this and feel confident enough to speak out. The coming NH winter should put an end to this power grabbing travesty once ad for all. First of all, my apologies for the Havel/Klaus misnomer in my comment earlier. It does not, however, distract from my opinion, fortified by someone with some political clout, who I have no doubt will accept my mistake. Secondly, the main question is, Vaclav, what will you do? What are your intentions? How will you be able to carry them out when pretty well everyone is against you? A rare thing indeed, a politian talking sound objective commonsense. Good for him. However, of course, non of this is being reported in the MSM which shows how difficult it will be to get the opposing message accross. Whilst not liking the cold, another really hard and cold winter will do more than anything to make more of the public more sceptical to this AGW lark. I would like to point out, that Vaclav Havel, in contradiction to Vaclav Klaus, is rather green-oriented, insofar the consumption of “ordinary” people, especially shopping centers, suburbian development and cheap traveling is concerned. On the other hand, he likes to use 6-liter BMW or Merc and in his villa, there is a quite nice indoor pool. Not exactly an energy-saving way of life. A rare thing indeed, a politian talking sound objective commonsense. Good for him. However, of course, none of this is being reported in the MSM which shows how difficult it will be to get the opposing message across. Another really hard and cold winter will do more than anything else to make more of the public more sceptical to this AGW lark. Whilst not liking the cold, lets hope Europe and the USA get another bad winter. Isn’t it a good thing that neither the MSM nor politians can actually control the weather. The only trouble is that they are as stupid (and/or arrogant) as King Canute in believing that they can somehow control the climate. Whoops silly me, they don’t believe this, they merely wish the hoodwink the public in to believing that this can be done so that the chattering classes of the MSM and politians can create a new world order. Is this a joke ? Many people are getting more and more skeptic of this politically infested climate scare. In my country (northern EU) I´ve seen polls on science forums with 70-80 % skeptical of CAGW. And the attitude is getting more skeptic (in my view, of course) all the time. Having also attended the lecture, Vaclav told of a recent meeting of heads of state, I think at the UN. There was the usual flannel about ACC by all present except for himself and he spoke his mind. Afterwards a surprising number of those there came up and thanked him saying that they basically agreed with him. Such are the majority of ‘statesmen’ who are currently living at our expense! Thanks for posting his exceptional speech John A! No. But break the news gently to the useful idiots who simply think they are saving the World/Planet by gulping and peddling the green snake oil themselves. They’re addicted to it and truely might not have anything else upon which to ground themselves – you know, like a rational mind. Your arguments, as usual, amount to nothing more than pathetic ad hominems. Don’t be silly, of course science matters to them. The problem is that climate “science” has become something more akin to lysenkoism. There is no level playing field, and there hasn’t been for decades. That is changing now, thanks in part to the intestinal fortitude of folks like Vaclav Klaus. In the case of climate science, the scientific process itself has been corrupted, so that the goal becomes the continuation of an ideology – that of Catastrophic Manmade Global Warming/Climate Change/Climate Disruption. Environmentalism has a lot to do with “old age and new age spirituality” as well as Native animism, energy is spirit and other mythical beliefs, not to mention the Gaia Hypothesis. I do concur with that. Nonsense, atheism is the non-belief in some “theist” position and there are a million ways to be an atheist. In fact just about every religious person is also an atheist since Christians don’t believe in Thor or Votan or Zeus or even Allah or the whole host of other gods that humans have alleged, so with respect to those other alleged gods Judeo-Christians are atheists in a rather peculiar religious way. While it’s true that most communists were not “believers in an alleged god” they did believe in the official dogma of communism upon threat of harsh treatment or even death. A friend of mine who escaped from communist Czechoslovakia tells me, he’d sit at his desk professing the wonders of communism while plotting his and his family’s escape and he had to be careful to stick to the party line since the person he shared the double face to face desk with was a devout communist. While my friend was an atheist he wasn’t a communist except in pretense so that he’d not end up in some prison doing slave labor (as it was he was in an office doing slave labor but at least the pay was better and you didn’t have to wear actual chains). In a like manner many believers just pretended that they didn’t believe in their alleged god for the same threat of punishment. Above all was the forced believe in the dogma of communism, the state’s pseudo-religion. As an atheist I can tell you that I don’t buy into the Environmentalism “green at all costs even if it’s based upon bogus science” agenda one iota. As far as spirituality goes I’m as moral and ethical if not more so than many of the christians that I know. Further, communism is a “state religion and cult” just like any religion. A number of my family members lived under communist governments, as have a number of friends and professional colleagues. They clearly testify that communism is just as much a religion as any other, it’s about the “commune” and what binds it together, which is the belief in the commune and communist ideas. Any dissent is not tolerated. Which sounds just like most religions, and just like the Global Warming Environmentalism meme. It makes sense that hippie ideals of communes and environmentalism have a lot in common with communism as there are deep roots there. Shades of the 10:10 Eco-Terrorism (http://pathstoknowledge.net/2010/10/05/environ-mental-cases-eco-snuff-and-terrorism-films) there Dr. Glen Barry. “AS a global ecological change and political ecologist scientist, that is my assessment of the science, and what many other scientists think too but are too staid and afraid of losing tenure to say so. If accept Gaia hypothesis that Earth is alive; and lose major ecosystems which are akin to organisms’ organs, what else can you expect? What life is possible if oceans are dead from nitrogen, acid and overfishing? What if freshwater is simply not available? What of all these issues in combination, existing within a toxic soup of man-made chemicals. Read the science including between the lines to see what is really being said.” – Ecological Internet, Dr. Glenn Barry in a comment to me on face book (http://www.facebook.com/photo.php?fbid=497711688664&set=a.101729918664.101430.84943913664&comments). Sounds to me like Dr. Glen Barry is reading too much in between the lines of the science and making up all kinds of dark imaginings. Dr. Glen Barry’s psychosis includes visions of doom and destruction which his expressions of “dark what if doomsday” scenarios seems to indicate. Dr. Glenn Barry seems to paint a very bleak picture of the future, and for the most part all his visions of the future that I’ve read on his facebook wall are dark indeed. End of life. End of Earth. Doomsday. 2012 movie style. And we are to blame. Rational discussion seems to just bounce off this type of Gaia Religious Environmentalism. James Sexton said on President Vaclav Klaus: Climate Control or Freedom? It never ceased to amaze him how readily people will throw in the watermelon accusation. It only shows how little the people who do that know of both environmentalism (and I really don’t like the term because it has been emptied out of meaning by too many people who have absolutely no clue about the relationship between humans and the environment being associating themselves with it but I use it for lack of better term) and communism. Not surprising given that they have been fed tons of propaganda nonsense about both for many decades, but this is no excuse. And the reason communism has nothing to do with environmentalism is that it does exactly the same thing that capitalists do, which is to put man in the center of everything and forget about the simple and quite obvious fact the humans are part of the ecosystem of the planet and they absolutely depend on that ecosystem being intact and stable for their own survival. 1. Vaclav Havel is a “environmentalist” x Vaclav Klaus is a “anti-environmentalist”. 2. Vaclav Havel is a “softsocialist” x Vaclav Klaus is a “capitalist”. These two men have a completely different world views. Even more interesting given where he comes from, and that other people with pretty much the same mindset like Lubos Motl also come from the same place. It seems like some people in the Czech Republic hated the Soviet Union so much that they jumped straight into the complete opposite, i.e. blind faith in the omnipotence of free markets and the infallibility of free market democracy. So, GM, I take it that you are not from America, you know, the Country whose founding was based upon the Constitution with its emphasis on individual freedom and Liberty as opposed to Central Government controllism? And you really don’t have anything better to offer, just the same old evolutionary dead end Totalitarianism, facilitated in fact by the excess wealth produced by your [purely psychological] nemesis, Capitalism – which makes your mentality, GM, a true case of “ecological overshoot”, and thus useless at best. So why don’t you try creating wealth for once, instead of trying to control everyone else in hopes of salving your inner turmoils? God, I wish I had said that! If anyone would know, he would. Well done, sir, keep it up!! Good post. Global Warming measured in inches this winter. Reality is so tough on true believers. So the choices are “Climate Control” or “Freedom” ?? “In spite of that, we have to add that over the last ten thousand years (the era of Holocene), the climate has been much the same as at present and the average surface temperature did not vary significantly. The last 10,000 years have been just as stable as the bottom end of the last Ice Age (20,000 years) preceeding it, before the ramp up to the Holocene Warm Period [interrupted only by the Younger Dryas]. The rounded hill of the last 6,000 years suggests an ‘on the way to the next Ice Age’ grind over the next 16,000 years. No reason to get excited. We can cope with glacial-speed climate change. It’s the mad panic button stuff that’s scary. I highly recommend you visit with someone who had the unmistakable displeasure to live under Communism, and remember what happened to the environment of Eastern Europe and Southern Soviet States (like Uzbekistan) under that rule. Nice logic. Only problem is that it fails completely because have 325678597 religions and at most 1 of them is right. But given that if there are N religions, and at most 1 is right, this means that at least N-1 are wrong. Given that there is absolutely no way to say which one is right, the safe assumption is that all of them are wrong. That’s the probability argument. Which isn’t even needed because atheism follows directly from common sense (nobody has proven that God exists, and the burden of proof is on people who claim that invisible beings in the sky exist, not on those who don’t) and from the fact that science has been very successful in explaining the world around us without having to resort to any kind of supernatural forces. Depends on how you define “freedom”. Everyone should be as free as possible to the extent that he doesn’t destroy the commons, i.e. doesn’t jeopardize the long-term survival chances of the species. The problem is that our animal instincts force us into precisely the kind of exuberant behavior that destroys the commons. So some restraint has to be exercised. If people had the education and wisdom to see that, there would be no need for external forcing of that restraint, but sadly, this is not the case, so until we have everyone to a minimal level of scientific literacy, it will have to be imposed in a top down manner if it is to happen at all. To the great satisfaction of those horrified by that idea (which is because they haven’t reached the aforementioned minimal level of intellectual development and literacy), and to the great horror of those who happen to see further than their nose, this isn’t going to happen. Willis, this is one of the most beautiful articles on any topic I have ever read. Thank you for your humanity, your ability to describe the wonderful people you met, and your logic and reason in understanding the importance of meat to the human diet. Appeal to reason, indeed. Mr. Klaus is one of very few modern politicians who will be remembered in history as visionary statesmen of integrity and wisdom. However, I feel overwhelming sadness. People listen to reason with utter disgust, only when there is no other choice, when it is the last resort; as soon as it is possible again, they return to their religious and ideological toys, and start lying to themselves and to each other with renewed gusto. Excellent CO2 records got back almost to the 18th C. The “received” trope that levels were around 270 is false. They ranged as high as 550, average 335. “The unknown exists. Each man projects on the blankness the shape of his own particular world-view. He endows his creation with his personal volitions and attitudes. The religious man stating his case is in essence explaining himself. When a fanatic is contradicted he feels a threat to his own existence; he reacts violently. You malign the good King Canute! Exasperated at the fawning over-praise of his courtiers, he had them carry him in his massive throne, down to the seaside at low tide. He then ordered the tide to withdraw. When it did not, he escaped his throne and had a few of the courtiers tied to it where the tide swallowed them. An object lesson was had by all. GM’s claim that evil individualists are ripping off the commons reveals a core self-justification of the leftist enviro-freaks: that they are the true stewards and guardians of the c”commons”, and will, if necessary, impose their rules on those too stupid to agree with them. The power required for leftist solutions “corrupts absolutely”. I will repeat myself – want kind of person reads what’s written in front of him and is completely unable to understand a single word of it? That there are laws of nature that are immutable no matter what people’s world views are means that humans have to adapt their world views and actions to the laws of nature, or bear the consequences. Again, a very obvious point that apparently is too complicated for some to understand. FYI, there is no such thing as freedom in nature. Nature has laws and those laws are completely indifferent towards what people consider moral, compatible with their ideology, political, religious views or anything of that sort. That’s a fairly obvious point, but I find myself having to repeat it again and again because there is no shortage of people here who think that their ideological, political, and religious views trump the laws of nature. Huh, so we started banning people who have become too inconvenient or what? The communists talked a good talk about all sorts of things. It’s what they did that matters. In practice communists have largely treated the environment worse than capitalists. The usual reason given, and it seems sound to me, is that because nobody owns it, nobody is prepared to fight for it. Nor can anyone sue if they are hurt by illegal or dangerous practices. Regardless of the lovely words written, the toxic mountains and lakes of eastern Europe lay bare any claim that communists were greener than capitalists. GM, I did say I was making sweeping generalizations. How is it you can be so knowledgeable about somethings and so naive about other relevant topics? A co-founder of Greenpeace laments on the film “Great Global Warming Swindle” about the communists taking over the movement. While that’s just one opinion, look at the proposed solutions to this warming hysteria. They sure look socialistic to me. There is no wonder why the environmental label has become attached to communism. That said, I don’t believe the environmental label is representative of true environmentalists, and we seem to be in some agreement there. TWE’s post was indeed relevant. The paper suggests Lenin was very interested in environmental concerns, and while Stalin kept some preserves, he took a more pragmatic approach to the trade off of resource conservation and use of resources for the public good. Go figure, even commies have to eat and stay warm and move produce and goods…….etc…. Do try to keep up, please. Given that I didn’t(nor did the other 2 people I was referencing) use the term “watermelon”, me thinks you protest too much. Looking at the post your were responding to, the only one making that attachment was President Vaclav Klaus. I’m quite sure he’s fairly familiar with communists, and I also believe he’s educating himself on the current environmental movement. I am very curious what exactly is it that I said so that my comments don’t go through??????????? There is no such thing as freedom in nature. Nature has laws and those laws are completely indifferent towards what people consider moral, compatible with their ideology, political, religious views or anything of that sort. That’s a fairly obvious point, but I find myself having to repeat it again and again because there is no shortage of people here who think that their ideological, political, and religious views trump the laws of nature. That there are laws of nature that are immutable no matter what people’s world views are means that humans have to adapt their world views and actions to the laws of nature, or bear the consequences. Again, a very obvious point that somehow nobody gets. A non-anthropocentric society is by definition impossible. Any attempt to create one would have to be grounded in human extinction at worst and at best a kind of genocide of the many for the sake of the Prius-driving few that would make the dire events of the twentieth century look like a luvvies wine and cheese party. Anthropocentrism is a concept that human beings may regard themselves as the central and most significant entities in the universe, or that they assess reality through an exclusively human perspective. If you can explain how a human can “assess reality” through anything other than a human perspective, I’ll treat you to a nice ecologically correct dinner of roasted spelt, earthworm salad and muddy water. Vaclav Klaus likens environmentalism to communism because of its essential anti-democratic totalitarianism (e.g. “…it will have to be imposed in a top down manner…”) — that, I would have thought, is plainly obvious to anyone who actually read his speech. The ‘watermelon’ tag comes from the fact that so many former left-wing academics, commentators professional students and the like (the type, for instance, who still cling to idea of Cuba as an ideal society), adopted environmentalism as a cause célèbre to replace discredited communism. Oh no GM, I think most reading this thread know exactly where you’re coming from. There is no anthropocentrism problem — quite the contrary, the real problem is a bundle of malthusian misanthropy + environmental catastrophism (by the way, I would have thought that ‘peak oil’ would have been welcomed by so-called ‘environmentalists’). Humanity is not “in overshoot” (whatever that means), the climate has always changed, the rate of world population growth has halved since the mid-sixties (http://www.census.gov/ipc/www/img/worldgr.gif), cereal yields have trebled from the same acreage in the last 50 years — the proper role of (true) science has been and will be to enable more people to enjoy longer better lives while having less impact on the planet, the opposite of what the so-called environmental movement claim. The problem with ‘environmentalism’ is that it extrapolates from our present state of knowledge and expertise into the future. Environmentalists lack the imagination to envisage a future in any terms apart from those of the present (e.g. Ehrlich wrote in the New Scientist that the world would experience famines sometime between 1970 and 1985 due to population growth outstripping resources). >>between communism, socialism and environmentalism? They are all policies of the ‘nice’. If you are incapable of making tough decisions, and just want to appear ‘nice’ to everyone, you end up with communism, socialism and environmentalism. Who can argue with sharing your wealth with the less fortunate, having universal health care, or saving the planet? See what I mean. These are often the ‘nice’ policies of the PNBH, or the PNWH – political and civil service flunkeys who wander around a plush and comfortable office discussing last night’s TV shows. And yet they eventually become anti-democratic and tyrannical, in order to force their ‘niceness’ on everyone, whether they like it or not. PNBH – People who have Never Been Hungry. PNWH – People who have Never had to Work Hard. Of course human look at things through a human perspective. I was not talking about that. I was talking about the need to recognize that humans are no different than other animals and life forms and as such the same ecological rules that apply to those other species apply to use too. The anthropocentric world views I was referring to and that have dominated thought for many centuries almost invariably contain an implicit rejection of the above. However, it is in our best interest to realize that and change our behavior because if we don’t nature will do it for us. So, yes, we are and should be acting from a purely egoistical human-centric perspective, that’s what all organisms do. However, we should do that with the knowledge of what the long-term consequences of our actions are, which we now have, and, accordingly, think before we act, with the long-term interest of the species in mind. The idea that the rules don’t apply to us because we’re special is what prevents us from doing so. Atheism isn’t a religion (though it has its own zealots of course), it’s the absence of religion. I no more have to prove the non-existence of than I do the existence of fairies at the bottom of my garden. When one consididers the apalling brutality of many regimes held within the collective memory of my generation, the desire to protect the freedom of individual citizens must be held to fiercely, otherwise the sacrifices made for us and our freedom are as nothing. Environmentalism has little to do with concern for the evironment and everything to do with self-aggrandisement and self-enrichment pursued by many within the ruling elites and aided by noisy and willing fools who misunderstand both the science and the motivations of their masters. Does anyone else find it striking that the folks who assert veto power over a potentially inconvenient but actually existing fetus in utero are the same ones who want to give notional people three generations removed from existence the power to veto whatever the rest of us are doing today? Are you trying to say that there can never be a serious environmental problem that requires restraint of certain human activities in order for it to be solved? Because if you are not claiming that, what you said makes absolutely no sense. But if you are trying say that, then something is very seriously wrong with the way you think about the world…. There are measurements that go back much further than that. They were collated by Ernst Georg Beck who was immediately disparaged by the AGW proponents mainly with ad-hominem atacks. Beck collated measurements of atmospheric CO2 made by several chemists including Nobel Laureates over extended periods. The reason his work caused so much upset is that it showed that the level of CO2 in the atmosphere today is not extreme and the metrics are in considerable disagreement with those from the ice cores. You seem obsessed with the fact that there are a number of “rules” in nature that everything has to abide by. I take it that you equate these rules to the workings of an ecosystem. By doing this you severely limit your thinking. Humans as well as a multitude of different species are able to part take in radically different systems and this is the basic method of evolutionary adaptation. One of the core beliefs of many environmentalists that surprises me the most because of it´s anti rationality is that we should try to keep things stable. For example there is the romantic notion of the stable hunter/gather societies that in their view lived in perfect harmony with the eco-system or the absurd notion that we should somehow preserved the 18th century flora and fauna unchanged. These notions are in themselves anti nature. Thank you for proving by superior logic that you are wrong. There are only 3 religions. What is left is scepticism or agnostic. No, there is nothing special about the current environment, and on its own there is no point in preserving exactly this kind of environment. Species go extinct all the time, the climate changes, ecosystems move with it, so on and so on, these things happen all the time. What is important is to preserve a world that’s habitable for humans. It doesn’t matter very much what the details are as long as that condition is met. The problem is that in a world that’s full of people, very small perturbation of the environment can lead to conditions in which a only a smaller number of people can be supported than the number of people alive. Which means only one thing – death rates have to go up. The problem with death rates going up is that nobody will just roll up and die peacefully, which has certain unpleasant systemic effects, especially in a global civilization. Are you familiar with Russell’s Teapot? I suppose I’m technically Teapot-agnostic, but it’s hardly worth the effort of being Teapot-agnostic rather than Teapot-atheist. Otherwise I’d have to be agnostic about everything that could possibly exist in my imagination, and I just don’t have the energy. Somehow it does not seem quite right to be saying it, when in essence all we have here is an intelligent and humane man speaking his mind……but this man is a hero of our time. When I survey the sorry bunch of self-serving greasy-pole climbers we have had for a government in the UK over the past decades I envy the Czech Republic. Almost sounds religious don’t it? There are laws of physics and of chemistry but are there laws of nature? What would they be – if you put x amount of pollutant A in lake B then y fish will die? That’s chemistry, biology. I don’t know if there are. What are these immutable laws? I would like to know. So I asked the internet. A “law of nature” would therefore have had the flavor more of a paradox than something which obviously existed. …the means by which a rational being lived in accordance with this order was the natural law, which spelled out action that accorded with virtue. There can be little doubt that St Paul’s words imply some conception analogous to the ‘natural law’ in Cicero, a law written in men’s hearts, recognized by man’s reason, a law distinct from the positive law of any State, or from what St Paul recognized as the revealed law of God. The U.S. Declaration of Independence states that it has become necessary for the United States to assume “the separate and equal station to which the Laws of Nature and of Nature’s God entitle them”. Interesting. It seems natural law is in fact a philosophical and religious ideal. I think what GM means is the laws of Gaia. So in your very denial, you reveal your true belief. Now me – I am an atheist. I am also a lover of the natrual and wild places (what few remain) and no great fan of man, well not 9 billion (2050). But as a scientist and atheist I hate to see science being subverted by quasi-religious claptrap and political machinations. The difference between an atheist and an agnostic is semantic, not definitive. “Things fall down!” – says an atheist. “In my experience, and in the experience of all the humanity up to date, things have been falling down; since nobody knows it all, perhaps, a situation might exist in which things would start falling up but this is highly unlikely, to the extent that such a possibility can be ignored for all practical purposes,” – says an agnostic. I also agree with Nigel Lawson that “doing nothing is better than doing something stupid” . Yeah, me too, what he said. The problem is that in a world that’s full of people, very small perturbation of the environment can lead to conditions in which a only a smaller number of people can be supported than the number of people alive. Which means only one thing – death rates have to go up. Sigh. There in a nutshell is your problem. Your anti-human Malthusian worldview distorts your thinking (if it can even be called that). Humongous sigh. Who says we’re “destroying” the “holocene environment”? You Alarmists do come up with the nuttiest things. We’ve simply added some C02, helping plants grow, and maybe adding some slight amount of warmth, which, if true is also good. But, keep pounding that Malthusian drum of yours from up in your ivory tower. Meanwhile, down here in whoville, life will go on, despite your teeth-gnashing, snarling protestations. That maybe true for a coutry that is dominated by theists. Otherwise, people simply don’t care. Or the Flying Spaghetti Monster? As with the teapot – I am Spaghetti Agnostic. It is interesting to watch world politics now. 20 years ago you would never hear people express like and dislike of politicians in countries tens of thousands of miles away in which they have never resided. I get the sense that whether or not a true official world government is ever formed, the internet will create something of a world government by itself by allowing the world population to examine the actions of leaders near and far and comment on them. It is leaders like Vaclav Klaus that we have to cherish, because he understands the risks of letting this democratization of the world be hijacked by the poisonous influences like CAGW in its infancy. He understands that only by speaking out boldly will free speech be tolerated by all, and those who would seek to suppress free speech from all will be forced to allow it or appear as fools. More importantly, he also understands that as a world leader in the age of the internet, he may have been elected by a few, but the world is watching and needs to hear all views, not just those fed them by the media. In response to PWL’s interesting piece about religion and atheism. Strangely he is correct about Christians being viewed as ‘atheists’. They were so accused in the Roman Empire, partly because they refused to acknowledge the Emperor as ‘god’. I fear that realists, whatever their religious position or none, will be similarly accused unless this AGW nonsense can be stopped. “No, there is nothing special about the current environment, and on its own there is no point in preserving exactly this kind of environment. Species go extinct all the time, the climate changes, ecosystems move with it, so on and so on, these things happen all the time. What is important is to preserve a world that’s habitable for humans. It doesn’t matter very much what the details are as long as that condition is met. The problem is that in a world that’s full of people, very small perturbation of the environment can lead to conditions in which a only a smaller number of people can be supported than the number of people alive. Which means only one thing – death rates have to go up. The problem with death rates going up is that nobody will just roll up and die peacefully, which has certain unpleasant systemic effects, especially in a global civilization. So I take it that your goal for the planet is for it to be in a condition to sustain as many people as possible? Well then even if you have somehow gotten things a little right and we are heading for a warmer climate equating that with there being less resources for sustaining human life is somewhat of a long shot if everything goes into the equation and please don´t bring me that crap about 35 meters rise in sea level. It sounds to me that you are quite quickly turning around on the issue, you better watch out or you might find that you start feeling comfortable with us humanitarian utilitarians that hang around this place. Of course human look at things through a human perspective. I was not talking about that. I was talking about the need to recognize that humans are no different than other animals and life forms and as such the same ecological rules that apply to those other species apply to us[e] too. exploits every opportunity to do all the above. Otherwise you logic is contrapositive. And the number one law of nature………..illustrated by scientific findings in paleology, geology, etc., etc.,……………in force throughout the entire history of the earth is…………..
To survive adapt to change. And you jumped to this conclusion based on what? The goal of all organisms is to maximize the number of copies of their genomes. That’s what organisms are for – they are vehicle for the genome to propagate itself. A subtle point that’s beyond most people’s mental capacity to grasp it unfortunately. However, if you are a species that’s capable of ruining the whole ecosystem of the planet, and possibly even destroying most of life on it, going for as large progeny as possible in the short term is an extremely poor evolutionary strategy for maximizing the number of copies of the genome in the long term, because of that little overshoot and collapse thing. The problem is that evolution doesn’t really work with the long term in mind. If you don’t make it past the short term, you aren’t going to make in the long run either, and no organism before us has been smart enough to be able to see the consequences of its action many generation down the road (not that the collectively are). As a result, our thinking if focused on the short term and we have very steep discount rate for the distant future, and we are in the situation we’re in right now. Translation: My remarks hit home. This from someone who has made (at last count) 15 comments, including one where he frantically asks why his comments “aren’t going through”!!! Sounds like someone is desperate. What do you mean by just “starting to think”? That’s the nearly exclusively stereotyping mentality you came here with right from the start, blathering as you were about low i.q. rednecks, creationists, and people who were unpossessed of the ability to think rationally and scientifically simply by virtue of existing outside of Academia and having views different from those of “Academia” – yet another of your own comfortable, self-serving stereotypes. No, GM, your predominately bigoted approach to debate has been quite apparent ab initio! Therefore, GM, by now it has been well proven that it is you who is and has been totally resistent to reason and real science, and I’m afraid it’s that which is “hard wired” within you, not your imaginary antagonists – although it might be of some comfort to you that the groupist and self-annointed [faux] “intellectuals”, Barack Obama and Joe Biden, seem to have shown that they have the very same defect and are therefore currently making the very same [assiduously de-realized] arguments, which likewise depend only on “begging the question” and calling other people “stupid”. GM is a drone living off the productive members of society, who gets to make lots and lots of comments on this thread and others throughout the work day. The time stamps say it all – just like Gavin Schmidt’s time stamps show that he often spends his entire taxpayer-funded work day posting on RealClimate and other blogs. Taxpayers incorrectly assume GM is giving them 2080 hours per year of work in return for his annual salary. Obviously GM is cheating those paying the freight. No doubt GM will attempt to rationalize and excuse his goldbricking while suckling at the public teat. But he fits a pattern common to many in his loafing profession. No doubt a guilty conscience is insufficient to convince academics like GM to give those paying his salary an honest day’s work. Arguing on-line with everyone else throughout the work day is much more fun. Because of the lackadaisical attitude of people like GM, U.S. schools are going to hell in a handbasket. LOL. If taxpayers were willing to give us some more money so that we can buy more powerful computers so that I don’t have so many 10-15 minutes periods in which I can’t do anything because I am waiting for stuff to compute, then maybe I would have “worked” 24/7. As it is I only wait for stuff to compute all the time that I am not sleeping or eating. Not enough, I know. As I said above, “No doubt GM will attempt to rationalize and excuse his goldbricking…” Bingo. Plenty of those “10 – 15 minute periods” in this thread alone, eh? 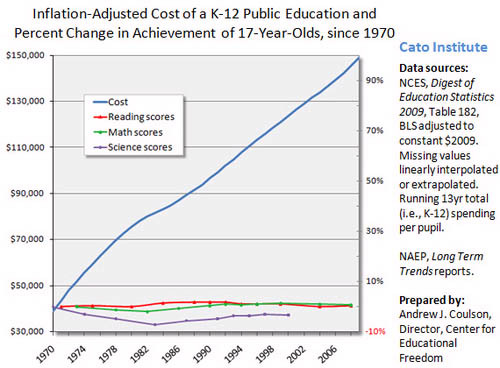 Most professionals know about the immense waste in higher education – which is even worse than the K-12 charts show. We know about the games played by tenured academics who have gofers do their work, while they play on their computers. It’s only unusual that GM and Schmidt are so blatant about it. Oh, and James Hansen, too, can’t forget about his scofflaw jaunts around the world spreading his personal eco-wacko propaganda. These drones all have the same mindset: the unappreciative public owes them, but the hard-bitten productive taxpayers aren’t opening their wallets wide enough to suit these academic goldbrickers. We all know how the grant game is played: sing “global warming” long and loud enough, and *ahem* “research” grants come through. Payola, pure and simple. It’s probably not much different in other politically correct “studies,” but the climate game is the most blatantly egregious, eg: Michael Mann’s $1,800,000 “research grant” to study mosquito vectors. Why didn’t the grant go to a mosquito expert? Answer: Mann’s mosquito research grant was payola. You confuse me. So you don´t want the planet in a condition to sustain as many people as possible? Even for an environmentalist this is a far out opinion. I get the feeling that you need to structure your thought process better. It helps if you first start by defining what your ultimate goals are and then we can debate the means of getting there. Just shooting of argumentative shotgun blasts in different directions and mixing up evolution, genetics, the rules of nature and the importance of the elite ruling while at the same time clearly believing that you are mentally superior to everyone else at this blog does nothing to further your cause. Hardly an extreme opinion at all for an environmentalist. One way or t’other their arguments and assumptions always circle around to: “there are too many people, more will be much worse, time to reverse the curve and get back to …” and then there are different numbers. Some go as low as 250 million for the planet. Like certain evangelicals, they all consider that they would be among the select, even if they outnumber the assigned slots by orders of magnitude. For a little antidote to their idiot assumptions and claims, check out overpopulationisamyth.com . Correction to the above: some go as low as zero.